Kurrawa Beach, located on the Sunny gold, is the most popular beach among the Gold Coast surfing enthusiasts. 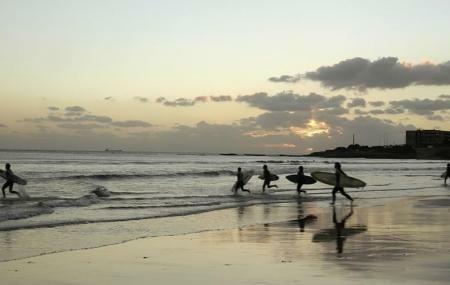 It has the most extensive beach reserve that runs for 1.5 km and is home to the Kurawa Surf Life Saving Club. This Surfing club is the newest on the Gold coast and promises to deliver state of the art surfing facilities. Towards the north of the main beach area is a playground and a pond. The park nearby offers a perfect destination for a leisurely stroll after the water activities. The Surf can be hazardous. Remember to swim only between the flags and obey surf lifesaver instructions and signs. We have eaten breakfast at this surf clubs may times and it's always delicious. There is such a spectacular view from this club and on a sunny day its so lovely to sit here and have brekky. The menu is good, with lots of different choices, ample servings and reasonable pricing. They make a good cappuccino and the customer service is quick efficient. We were here yesterday for a late lunch and although it’s the week-end for SLC Australian Titles, we were able to park easily, get service easily and enjoy the view that never disappoints. The Kurrawa Burger 🍔 is well matched with a schooner of 150 lashes. Staff are always efficient and friendly and the venue is spotlessly clean. This was my first visit to Kurrawa surf club and I will definitely come back again. The staff were all fantastic to have a banter with and a laugh. The food was lovely and reasonably priced and portioned well. And despite the full house, we did not have to wait too long for it to be served. Will definitely return again. Might try breakfast out this time, I hear it is great! We had breakfast here after walking there from Burleigh Heads. Menu and food were excellent with gluten free options which is important to us as we have a couple of family members who are gluten intolerant. Prices seemed a little higher than I would expect but the food, meal presentation, coffee and overall service justified the prices. If you're a member of the surf club, there are discounts. I had really low expectations going here and stunned at the service, professionalism and food. From our welcome, the polite, helpful and efficient staff had is seated, informed of how to order and what section we were seated in. They were patient with our meals as some of our party forgot what the ordered. The drinks were ice cold and the beer delicious. I had the Gnocchi which was excellent, the onion rings will not disappoint. Another in our party had the steak, cooked perfect medium rare with an unfathomable range of condiments available. We'll be back. Best value meal and best service of our recent trip to Broadbeach.